Line a pan with foil. 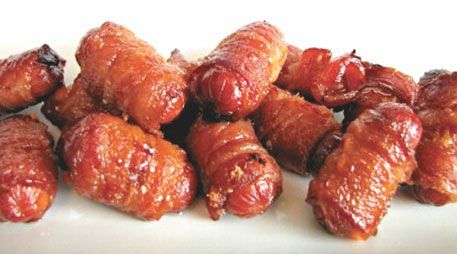 Cut bacon and hot dogs into thirds and wrap 1 piece around each mini hot dog and secure with a toothpick. Rub each piece with brown sugar. Place on pan and bake at 4000 for 10 minutes. Flip and cook an additional 8 minutes or until bacon is crispy. Pound out the meat with a mallet. After chicken is thin, cut it into 1-2â wide strips. Cut the package of bacon in half. Take one strip of bacon and lay a strip of chicken on top of it. Roll the bacon/chicken up and secure with a toothpick. Repeat with remaining chicken. Place on cookie sheet. Top the chicken with brown sugar then bbq sauce. Cook for 15-20 minutes at 3500. Turn them over and cook again another 10-15 minutes or until cooked through. Tip â Any meaty part of the chicken can be used.